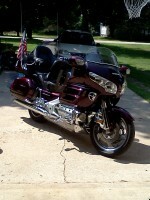 Motorcycle: 1983 GL1100 Standard (no fairing/bags from factory) with 38K miles. I just purchased my first GW today!!! I've had a long riding career and have owned many HP motorcycles, but I just turned 51 years of age and I purchased a new Suzuki V-Strom 1000 DL (previous bike was an '08 Suzuki BKing) that isn't with me currently, so I'm on assignment in the Pacific Northwest and figured I needed a bike, so being on a tight budget, I found this (Standard/no fairing or bags OEM) with 37K original miles. I will be leaning on you guys for guidance from time to time since I know ZERO about GW's. Wanted to introduce myself. Hi all! You didn't say if it was in running/roadworthy condition or not, but regardless I'd be changing the timing belts unless you know it's already been done. Replacement belts are Gates T274 (Gates makes the OEM belts) and are available at local autoparts stores around $40 ea, or if you order on-line Amazon sells them around $17 ea. This is an interference engine and if a 36 year old belt lets go the engine is pretty much junk. It is in really nice shape. The chrome is in excellent condition as well as the paint. It runs really well, if not a touch rich. Starts immediately. The T belts were changed at 32K and valves adjusted per previous owners records. Everything works as it should. The tires are dated, but not cracked or dry rotted, although I'm going to be taking the wheels off the bike and have new tires put on asap. You got to post some pictures. I know this may seem weird, but I've been dreaming of riding the coast since I was a small child growing up in Indiana, today I made that happen, it was spiritual, and it was a pleasure to do it on such an iconic motorcycle like this '83 GW Standard!!! I picked it up today in Albany, Oregon and immediately headed due west for the coast of Oregon. I rode through some really great coastal towns, had a fabulous meal of fresh seafood and topped it off with cheese cake and a slice of lemon pie and freshly brewd strong black coffee. I spent hours in the fridged sea air, spats of rain, clouds and sun. I could not have been happier. Yes, I have newer bikes, but this GW has a soul, a feel as if it speaks to you as you ride, nothing like the experience I feel on my new bikes. I will sort out the GW's short commings and enjoy it while I'm here in the Pacific Northwest. I nice find! She looks to be in really good shape! 36 yr old bike and she's hardly broke in yet! I've had my '80 for 14 years now, many cross-country trips, several traveling 2-up pulling the camper. Fabulous machines, even in eastern Colorado pulling the trailer on the interstate at 80 MPH in 95 degree heat she just hums right along without a protest! That is one beautiful sample you got there, love the stance, looks perfect. She needs lots of TLC, currently waiting on me making some room, so i can take care of some corrosion issues. PS. Make sure you check your alternator yellow wires wiring plug/connectors at the left side of the battery and the voltage regulator under the shelter for melted connectors due to heat from resistance from loose/corroded connections. This is the other thing other than the timing belts that will put a hurt to this bikes. Make sure you inspect the back side of the plug/connectors. Did some light cleaning, between the rain and got it covered. Need to find a GW guy here in Portland, Oregon or Vancouver, Washington, anyone know of a good guy here? Finally cleaned up and covered!!! Howdy Drew440 and welcome to the forum. You did find yourself a great bike there. And yes, the coast there is some of the best riding in the USA! Be sure to turn the petcock to off when you get off to prevent any fuel leaks while it sets. They have a tendency to do that, sometimes, and hydrolock the motor(liquid in cylinders doesn't compress and can bend the rods). If it happens, pull the spark plugs, cover the holes with rags( to stop squirting gas shooting out far), kill switch off, and crank over the motor to expell the liquid. I'll pm a number of a guy up there just north of Vancouver WA. 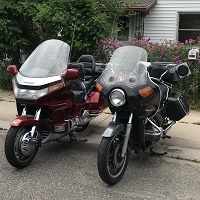 I have plans to ride up through from San Diego in June, as it's been 6 years since having some NW riding, on my way to NH for the summer and fall, but having concerns over the gas prices now, I may have to shorten my trip to a bit more direct. Enjoy your wing. I have an 83 Aspencade and have always wanted the naked GL. I ride my 08 wing as my tourer now. The 83 is in need of some new fork tubes so it's sitting on the jack for now. I also have a 75 CB750 K5 and a 76 K6(in restoration mode). My 76 when I found it at my friend from high school. It sat in his shed since 1994. Frozen motor being rebuilt now. Very nice. Everyone on this forum has good information and I'm sucking it up like a sponge, thanks guys!